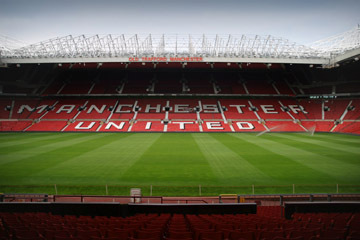 The home ground of the current Premier League champions and one of England's most successful teams, Manchester United, Old Trafford is also the largest club stadium in the country. Old Trafford has witnessed its fair share of history over the years, particularly given the success of United, who have now won more Premier League titles than any other after lifting the 2010-11 championship trophy. It held FA Cup finals until Wembley was built in 1923, and was bombed during the Second World War as it was being used as a military depot, forcing the club to play games at Maine Road, home of arch rivals Manchester City. Old Trafford was a host venue for both major football tournaments held in England, the 1966 World Cup and 1996 European Championships. It also stages the annual Rugby League Super League grand final and hosted the final of the Rugby League World Cup in 2000. Aside from United, Old Trafford has played host to a number of England internationals whilst Wembley was being rebuilt at the start of the 21st century, and has a current capacity of almost 76,000. Another frequent Rugby venue, it will be hosting matches in the 2015 Rugby World Cup. During the Olympics, the ground, which also held the 2003 European Champions League final, will stage preliminary games as well as being the venue for one women's and one men's football semi final.